After Sammy’s death, we pretty much threw all of his things in plastic storage containers and stacked them in the closets in his bedroom. We just weren’t ready to go through his things, and I certainly didn’t want to give anything away for a while. I’ve written blog entries about some of the things we have donated or shared with other children with HPE, so I have let go of some things when I knew there was a need by another child. Five years later, Steve and I are currently in the process of cleaning out those closets and transitioning Sammy’s room into an office where I can do my work for Families for HoPE and hopefully begin working on Sammy’s scrapbook again. As we empty and clean his room, I can’t help but think about the weekend in 2003 when we painted and prepared the room for Sammy. He was about 6 months old, and we decided that Sammy needed more space and the amenities of the master bedroom would be better for the nurses who worked with him at night while we slept. With the help of our family, we spent an entire weekend painting and getting the room ready. 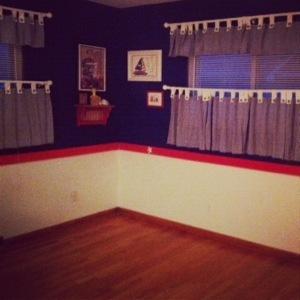 By Sunday evening, we were able to officially show him his new room. As I carried him into his room and laid him down in his crib, I was shocked by what I saw. The dark blue walls reflected off of Sammy’s pale white skin and made him look blue! I couldn’t help but laugh at the irony. My baby with a tracheostomy who had a knack for holding his breath was in a blue room that made him look blue! What was I thinking?